This little black velveteen sack contains 2 of Celtic ROOT beads, 2 of Celtic BRANCH beads, 2 of Celtic TOWER beads, 2 of Celtic TUB beads and 2 of DRAGON beads. 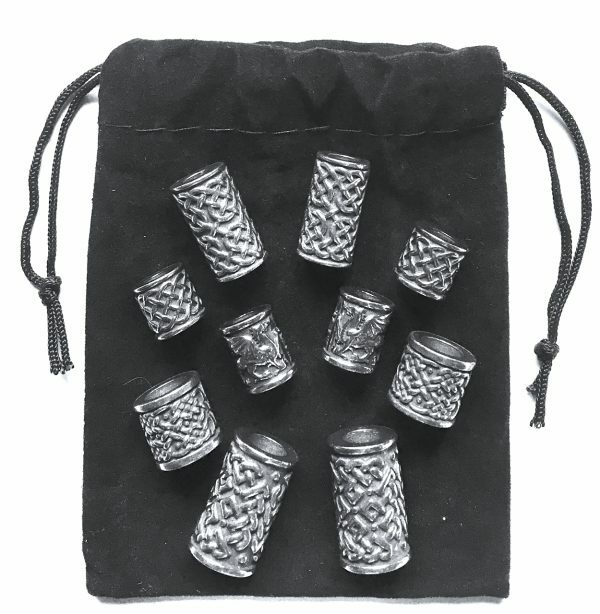 They are drilled with 5mm and 7mm holes and will be perfect for braiding into your beard! 10 small, black hair elastics included. Free. And when your beard is beaded, please send in a picture for inclusion in the Beard Gallery!